I have been pretty quiet and not blogging much due to being sicker and unable to write. I can’t keep up right now. I am trying my best to share my experiences to help others. i figured this one was important. 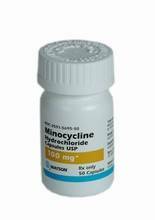 I was just put on a new treatment last week of an IV form of Clindamycin and oral form of Minocin (Minocycline). I was to work up to 6 pills of Minocin per day or 2 pills 3 times per day. Well I made it to about 4 pills and I was so dizzy and had bad vertigo. I was running into walls, swaying back and forth, walking funny and looked like a seriously drunk guy after a night of drinking. Te Clindamycin didn’t seem to be as bad. I worked my way down to 2 pills of Minocin per day and then finally to 1 pill and I still could not function. The night I had 4 pills of Minocin (after doing my Clindamycin IV bag) I was running into things, had troubles standing up and felt like I was on a bad LSD trip. I would close my eyes and see patterns and feel like I was floating in water. I was drifting in and out of consciousness. I just wanted to sleep. I heard noises that weren’t real and saw flashes of things like hallucinations. I hear you need to take vitamin B6 while on Minocin but I take B6 daily. I have no idea why I was so messed up on Mino. I am still dizzier than usual today and I stooped taking it a few days ago. My primary doctor pulled my IV and took me off both meds saying that they are both very bad for my body. She did not agree with my LLMD’s prescription of these meds and feared it would do too much damage to me. After feeling how I feel I agreed with her and stopped the meds and IV treatment. For now I am taking a break from all antibiotics after nearly 2 years of treatment and just ignoring all doctors for a while. I already feel too sick to function anymore and taking meds that make me even worse is not worth it. I can see if I herxed and it was over but not getting vertigo for a week. By the way I did detox a lot and I have no idea why these meds were so harsh and neither did my LLMD. Maybe my body hates the meds or maybe it made the 30 year old bugs really mad. Just be careful and start slow if you take Minocin if you have Lyme disease and coinfections. After losing my good insurance I used to have while employed I was put on many county and state insurances that only allowed me to go to free clinics. For the last 3 years I was unable to follow up with my doctors I have been going to for the past 10-20 years. 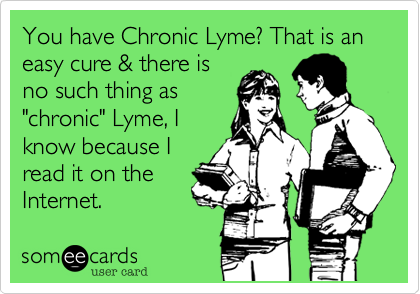 Plus with Lyme your primary, rheum, specialists do not believe in chronic lyme so it makes you not want to see one. Now that i have Medicare I needed to establish a primary doctor so when I visit the ER I can say I have a doctor and I need someone besides my LLMD to check up on thyroid issues and all the other non-lyme issues. So as usual I had such a wonderful visit with my new doctor. She walks in and says “why do you have an IV in your arm!”. Then she asks me what medical issues I have an I got the usual responses. I told her about my chronic lyme and she tells me how she knows I do not have chronic lyme (even though she knows nothing about me). She tried to convince me how chronic lyme is very rare and people that have it have heart attacks only so that is why I do not have it. 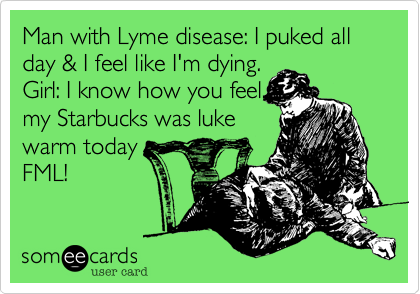 She asked me “so why do you think you have lyme disease what are you symptoms”….as I am sitting their in pain and can barely talk, think or speak. So I said which of the hundreds of my symptoms do you want to know about. So I name a few and her reply was “these are all very common symptoms”. I tried to mention my MTHFR double mutation, mold issues, mycoplasma…etc and she says those are all nothing to worry about and you don’t need medicine for them. I mentioned Babesia, Bartonella which she ignored. So she wants to test me for HIV, Hep C, Syphilis… all these have symptoms I don’t have and they don’t have hundreds of symptoms just numerous ones. So I can already tell that my tests will be negative. She said my high ANA’s (Lupus) were also probably just a fluke and I don’t have Lupus either. 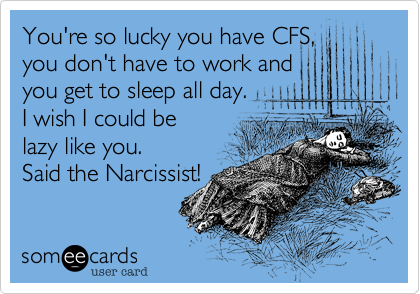 She says I just have Fibromyalgia and CFS (as I already know I have). 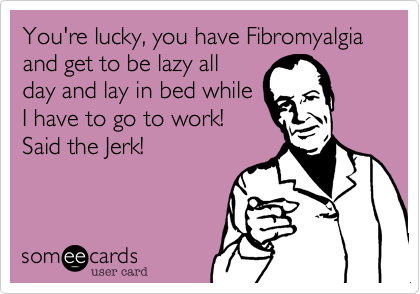 The problem is that I have way more symptoms on top of my Fibromyaglia (FMS) and Chronic Fatigue Syndrome (CFS) that are not FMS and CFS related but doctors don’t like when you bring up symptoms or know things they do not. She thinks I am new to being ill when I have 30 years experience and too many idiot doctors to count who misdiagnosed me or treated me wrong. I hate going to the doctor because they make you feel like you are just being a big baby and your pain is not as bad as you think. They make you feel lazy and fat. She tells me I need to exercise which is easy to say when you are not dizzy and running into things, in pain 24/7 … etc. She referred me to another rheumatologist. Here we go again with the run around. She made me take my IV out and took me off all my Lyme meds because she said the meds I am on are all the worst and will damage my body. 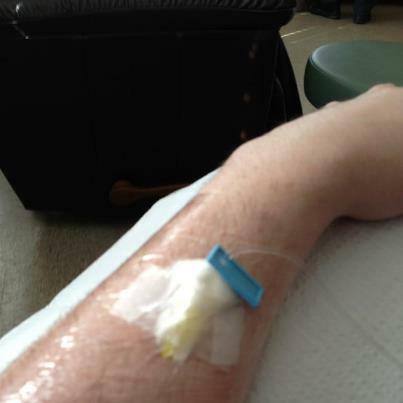 She said the IV will ruin my vein. Which I agreed with so I allowed her to take the IV out and stop the meds. After my Candida scare a while back I don’t want to go through that again, I almost lost a part of me. I know doctors and LLMD’s don’t get along and mock each other but I am not a fan of either. 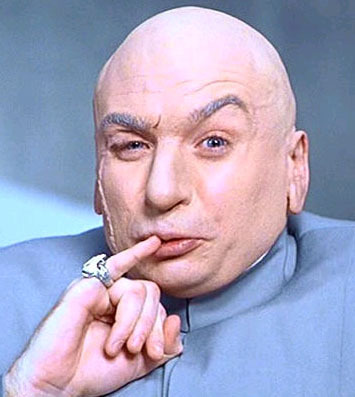 My LLMD knows I am broke yet they push all these expensive meds on me and they get pricier each month. 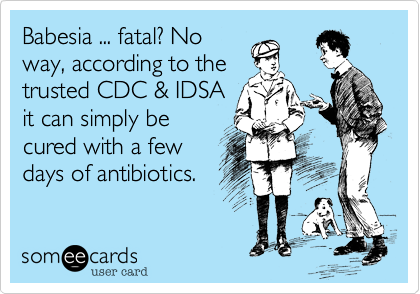 I never get a break from all the antibiotic and my body is paying for it with c-diff and candida…etc. I am not some lab rat and if I want to take a break it is my body. On the other hand primary doctors are uneducated and they lack compassion. They read one thing about lyme in a book in college and that is what they live by. Who cares that you are sick and in pain and have proof you have lyme they know better than you and make you feel stupid. I am so lost right now and I DO NOT trust any doctors at all. I have yet to meet one who listens to me, feels my pain or knows what I am going through. They always just assume when you say you are in pain that you have the same tiny pains every other person has. I literally feel like I am dying I am not just using the word “dying” incorrectly! Woke up at 7am (my usual bedtime or near it) after one hour of sleep to head on the long car ride to see my LLMD. There was a lot of traffic due to the holiday travelers.So I ended up getting home at 5:30PM, talk about a long day. The car ride made me sick, the 3 hour IV made me feel worse. I had a blood clot my first day on IV. That is the reason I never had a Picc or Port since I am a clotter (MTHFR). I saw my main LLMD and one of the first things he said was “I think you also have Lupus but it’s not RA“. So good news bad news I guess. I went to ask if I could stop all oral antibiotic for at least 6 months to give my body a rest. Well after a talk with the LLMD I am still on antibiotic and will be for a while. He says I am real sick and not getting better so he is worried. He said it will be a long road. So the doc came up with a new treatment and asked that I get tested for mold health issues since he thinks I have those also. What fits all of these puzzles and positives tests I have every time I visit is that I was exposed to black mold for years, lupus runs in the family, bit by ticks, but by thousands of mosquitoes in one day…etc. So I am never in shock when I hear I am positive for something. I will be starting a peripheral IV for at least 3 months that I know of. I will switching from Clindamycin oral to Clindamycin IV. I am stopping A-Bab for now. Treatment below. *plus my usual supplements like; Vit C/D3, Fish Oil, Chanca Piedra, Milk Thistle….etc.